winetasting – It's Wine By Me! 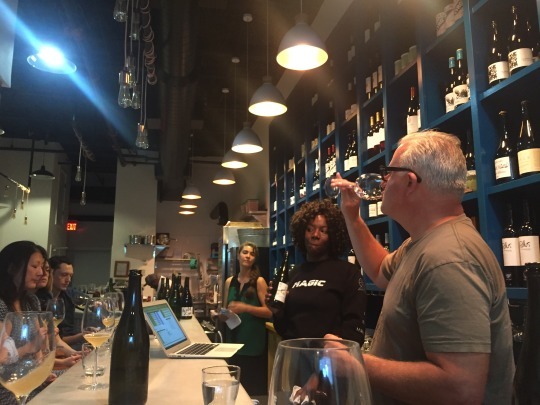 Stacey Khoury-Diaz and Janine Copeland of Dio Wine Bar hosted Abe Schoener of the Scholium Project for a wine tasting and discussion of natural wines. 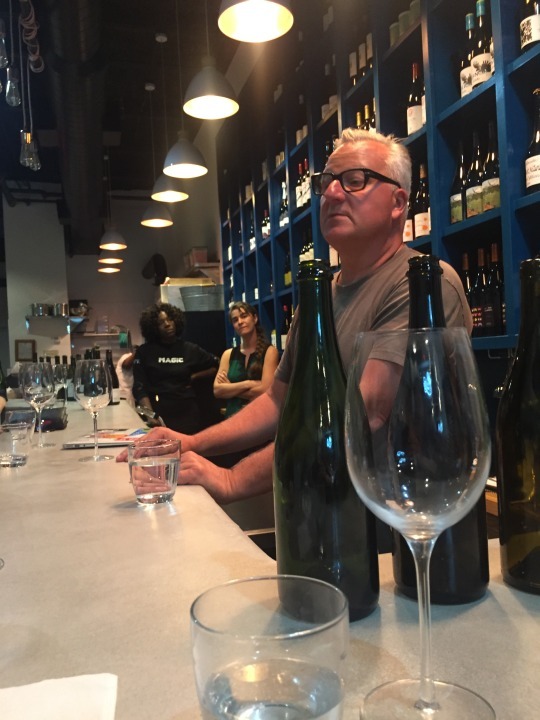 It’s a Monday night at one of the city’s newest wine bars and more than 20 locals have gathered around a bar with a renegade California winemaker to discuss spoilage and microbes in natural wines. If you think we’re in Brooklyn or Berkeley or even an international city like Copenhagen, Paris or London, you’d be wrong. We’re here in Washington, D.C., the city not less than a decade ago where those selling wine were more intent on engaging clients like lobbyists or politicians who would seek out the most expensive Napa Cabernets or Bordeauxs as a means to impress. But in the past few years, as D.C.’s food and dining scene grew (and as the lobbyists’ rules and bank accounts tightened), it makes sense that more diverse wine options would soon follow. A few key sommeliers started changing up their lists and introducing new regions and orange wine to the mix. Then in the past year, the momentum multiplied. So on a Monday night, Dio Wine Bar – which is also D.C.’s only wine bar focused solely on natural wines – became home for Abe Schoener’s D.C. debut. His wines have popped up in the city here and there, and he’s visited D.C. before (he’s a former professor from St. John’s College in Maryland), but this was his first sales trip to actively promote his Scholium Project wines. 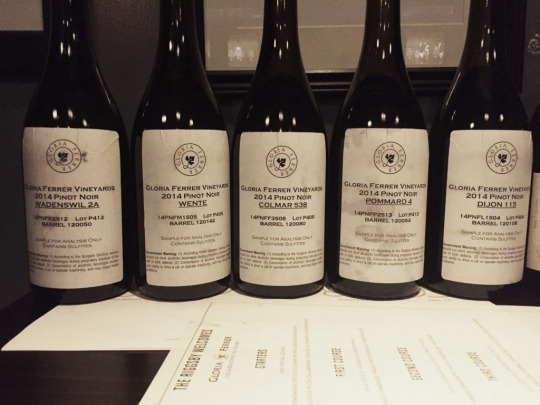 Eight natural wines from around the world were poured along side three Scholium Project wines. This was a smart move. I’ve seen other wineries – like RdV Vineyards in Virginia – provide tastings against similar wines from other regions. Not only does it give the tasters something to compare, but it’s a good teaching method and lends to a more memorable experience. Several years ago the only people who may have attended something like this in D.C. were industry. 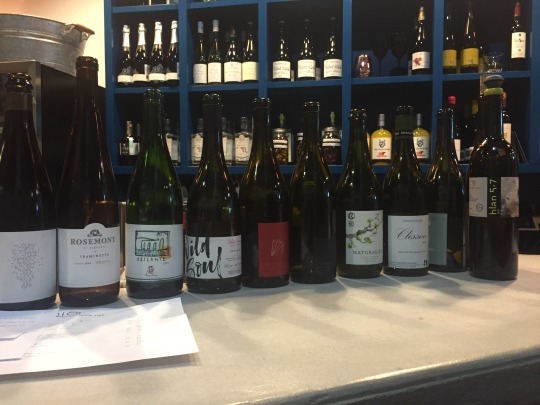 Instead the sold-out event was comprised of enthusiasts, including those just learning about natural wines, and a few super-geeky types, like me. While it’s certainly a sign of D.C.’s wine transformation, some of the participants noted it’s still difficult to find many of these wines throughout the city. Stacey Khoury-Diaz, Dio’s owner, suggested if consumers start asking for more of these wines, local shops and restaurants will begin to respond. Abe Schoener listens to some questions at the start of the chat. Capitalizing on the growing geekdom that’s here, this tasting was all about spoilage (and not necessarily in the negative sense of the word). Abe wanted to discuss the natural yeasty microbes which fight each other to eat the sugars and turn grape juice into wine during the fermenting process. He says that when the right microbes win, delicious wine is the result. So when he was asked several times for his definition of natural wine, the closest he came to answering it was to suggest that the discourse in natural wine should not be focused on the means of production (everything from how to farm the vineyard, to more industrialized ways of winemaking), but rather on the chemistry of winemaking. For example, he’s placed his grapes under high pressure and used electromagnetic forces to create cross-flow filtrations in his winemaking process. The more common answer from natural winemakers is usually about their yearn to translate the terroir (sense of place) into the bottle, their trials in avoiding filtering wine (not necessarily through scientific methods) and an argument over whether or not to use added sulfur. But “scholium,” means “commentary,” and that’s what Abe was seeking to do when he first created the Scholium Project in 2006 after learning about winemaking during an internship at Stag’s Leap Wine Cellars and later from famed Napa winemaker John Konsgaard. He says his wines can even been seen as his own commentary on some of the wines he enjoys, such as Cru Beaujolais and Edmond Vatan Sancerre. His wines are not supposed to be what you expect from California, yet they showcase some of the beautiful fruit coming from key vineyards and microclimates. 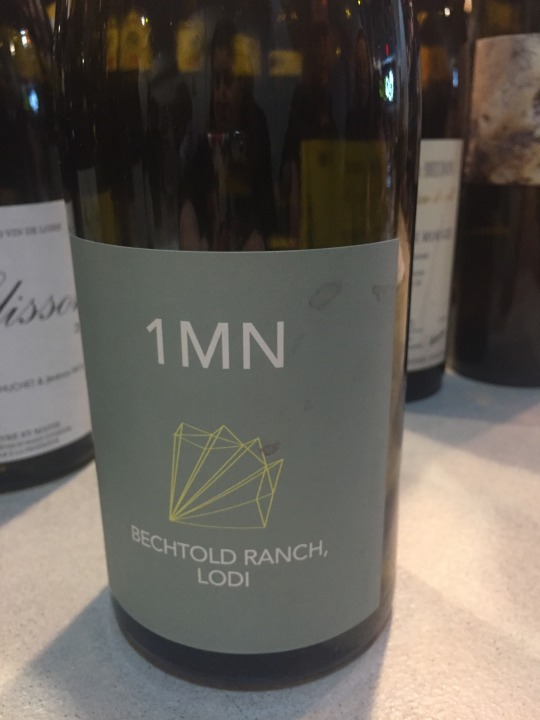 The 1MN Bechtold Ranch, a red wine made from 140-year-old Cinsault vines in Lodi, Calif. This was a fresh and vibrant wine exhibiting beautiful and tamed fruit. A light-bodied wine that indeed reminds you of something from Beaujolais. 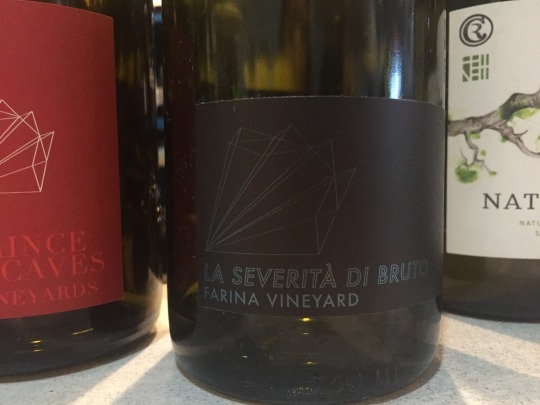 And two Sauvignon Blancs – La Severita Di Bruto and the Prince In His Caves – which both come from Farina Vineyards on the east side of the Sonoma Mountain. The vineyard sees very little sun – only around noon – so the resulting wines are more in line with what you might expect from cooler climates. 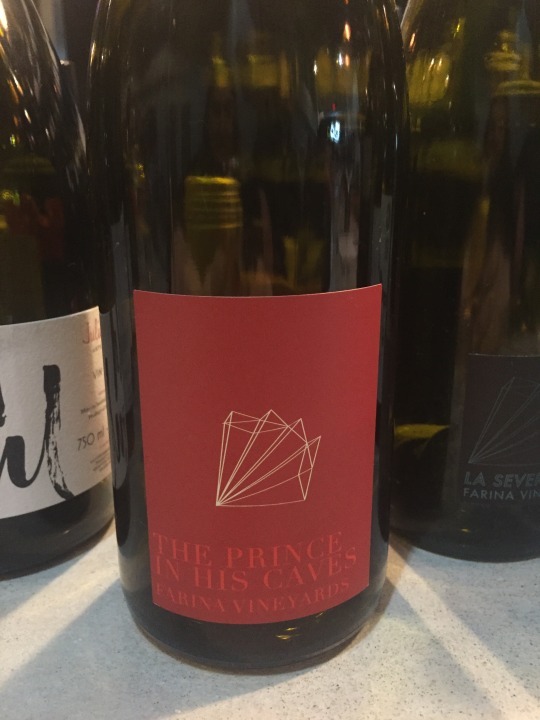 The first had a very distinct smell of rotting produce – much like the spoilage Abe brought us here to discuss, but it eventually blew off and the palate revealed amazing acidity underneath a crisp minerality. If you’ve ever enjoyed a Vatan, you’ll understand and adore this wine. The second wine, which spent more time on its skins during winemaking was a lusher wine with green vegetal flavors like asparagus and artichokes. All three maintained significant structure and were well balanced – values Abe strives for in everything he makes and are not necessarily a hallmark of many natural wines. While some like to define natural winemaking as a throw-back to past methods, Abe actually sees this kind of winemaking as post-modern and a way of looking to the future. The traditional methods still used sulfur or as industrialization came along, took advantage of what was offered. But today’s natural winemaking, he says, points away from the traditional and away from what’s expected. It’s those expectations that Abe’s wines have successfully avoided. And thats what makes his wines absolutely fascinating to taste, and even more enjoyable to drink. If you look closely at these bottles of wine, you’ll notice the labels don’t look like the ones you’ll find at a retailer. In fact, these bottles aren’t for sale. They were part of a specialized tasting sponsored by Gloria Ferrer featuring five different wine clones. Each of these Pinot Noirs were made from grapes grown in the vineyards planted near each other, but tasted wildly different. It was a perfect study in the importance of the individual vines. Curious to know more? Or what I’m even talking about? Take a look at my latest piece for the Napa Valley Wine Academy’s Pouring Points blog. 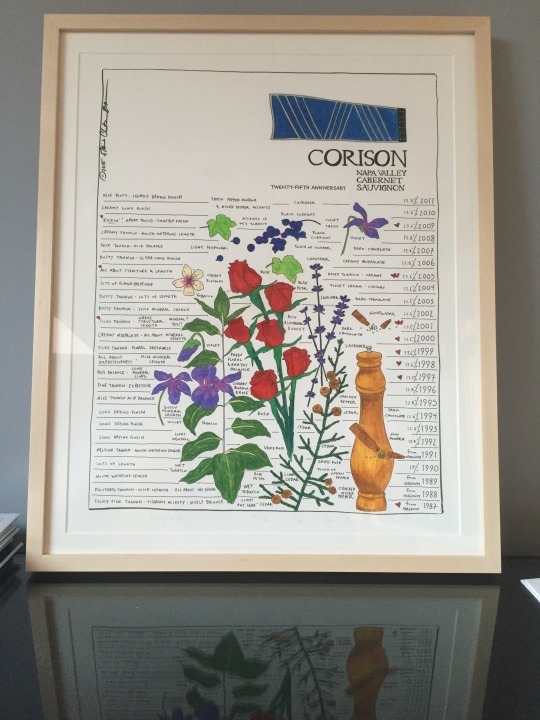 I had very high hopes to not only crush our Corison tasting, but come back to itswinebyme.com with brilliant notes about many of the vintages – or at least some unifying themes that could tie certain years together. 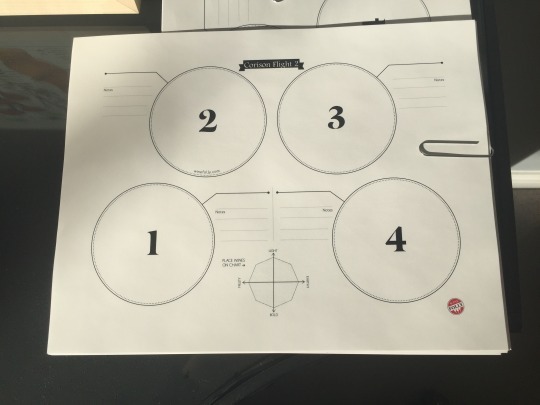 We were set up for success: Each tasting place mat included designated lines for detailed note taking. And I was more than prepared to write down legible thoughts. But there were five place mats – with four wines per mat. Reading back nearly a week later, the notes are only understandable enough to give a glimpse at what I was thinking, and maybe jog a sensory memory of two. But not enough to tell a riveting story. Fortunately, after 20 tastes of 19 different Cathy Corison-made wines, there were some key takeaways. Even more fortunate, I was surrounded by 10 knowledgeable and experienced friends. 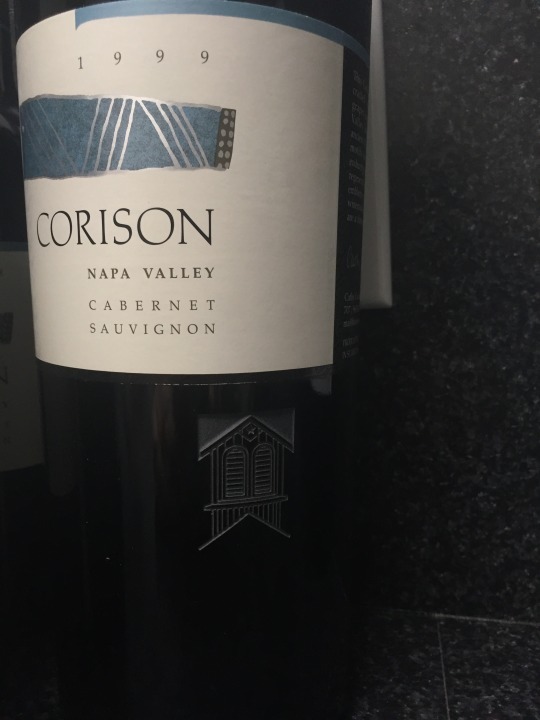 In Part 1 of this 21-vintage salute to Corison Napa Valley Cabernet, I noted there wasn’t a clear winner among the wines we sipped during our formal tasting. Yet when I sent an e-mail to the group asking for any “lessons learned,” many were in agreement with what impressed us the most. Pheww! This warmed my novice heart and I realized the value of this tasting was not about distinguishing differences in each individual year. Instead, it was a master class in understanding a particular winemaking style, and a tribute to how well-made wines evolve over time. Our biggest OMG moment came in the form of a 1999 magnum. This may not be specific to a Corison wine – in fact, it’s probably not – but it was truly the most jaw-dropping part of the night. The top half of the magnum was poured into one decanter, while the bottom half of the bottle went into a second. The two decanters were poured in the first and fourth glasses during our third flight (we were blinded with each flight – so while we could guess the general time frame because the flights were in order of oldest to youngest, we didn’t know what years we were tasting in each glass). Upon tasting, the wines presented themselves completely differently. The first glass was lighter with layered flavors and tannins. “Minty spice,” is what I jotted down. The fourth glass, however was much rounder and full-bodied. It tasted of dark inky fruit and had a green finish. Of our three hosts, the one who wasn’t involved in the blinding or serving of the wines shocked her husband when she was able to detect a similar component and asked if the two wines were the same vintage. But the rest of us were dumbfounded when the two glasses were revealed as being poured from the same bottle. So now we have an entirely new topic to investigate for another day! There were no detectable traces of a bad vintage. Each wine in and of itself could have stood beautifully on its own. For me, what continues to make this night so special is understanding the simple and gradual evolution of wine as it ages. It’s not that the younger wines can’t be enjoyed now. But all of a sudden, that 2006 bottle I fell in love with months ago no longer held a torch to some of the older vintages. It’s November, the time of the year when the commercial wine industry turns to Beaujolais Nouveau – the just-released candied-cherry-smacking wine from a region in France that has long been seen as the ugly duckling to Burgundy. The 10 crus of Beaujolais have instructed a series of working groups to identity and list individual climats by June next year, as they seek to emulate Burgundy by linking vineyards more closely to terroir. Phew – all that spanned a single afternoon. I must admit that I don’t know more than I did before we started. Sure, I enjoyed some over others. For example, the nose on the Chateaeu Grange Cochard Morgon 2013 had gorgeous herbal aromas that the 2012 lacked (yet the palate on the 2012 was more rounded). And certain wines tasted like they were trying to emulate Burgundy. But producer styles seemed to win out over terroir. When comparing crus within a single producer, that’s when I was able to slightly pick out differences. Of the three initial wines – it was the non-Cru designated Pierre-Marie Chermette Coeur de Vendanges that I enjoyed most. I went home later that night slightly unsatisfied with no overarching themes for individual Crus. 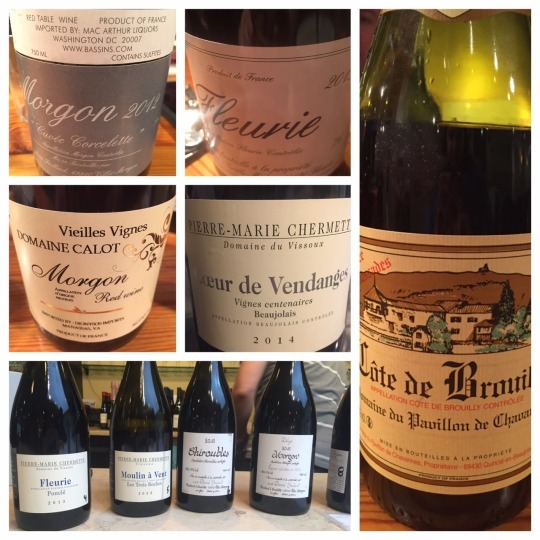 traditional Burgundian winemaking methods – this can cause confusion as each gives a very different wine style. I wasn’t as in love with these wines as I wanted to be. Nothing blew me away. They were all bottles that generally do fit my palate and were enjoyable. But it’s a wine I would pull for an occasion: a pairing with a roast chicken dinner or a table of friends who just want something light. I must say, Cru Beaujolais really does lend itself to Autumn. It’s a beautiful transition wine from the hot summer days to impending doom – oops, I mean cooler weather. But then something interesting happened. We had a lot of leftover wine and I brought home the three original bottles that I brought –and snagged the rest of the Métras Fleurie. About two days later – after some time in my refrigerator and then warmed back up to about 10 degrees below room temperature, some of the dirtier/earthier flavors started to emerge. The wines tasted fuller, and more rounded. Day three only enhanced that. Cru Beaujolais, which is meant to age (quite the opposite of Beaujolais Nouveau, which most of the wine-drinking public associates with the region), really does benefit from either time in the bottle or a healthy decant or lingering in a refrigerator for a few days after opening. Any future real comparative tastings would probably benefit from one of those methods. As for which Cru I prefer or can properly describe, I still don’t know. And I’m ok with that. Making my way through 10 different terroirs and more than a handful of recommended producers will take a bit of time and is certainly not a bad way to continue on my wine journey. Just like any good wine lover, when I hear the word Burgundy, my ears perk up, my eyes widen and my tongue may even start to salivate. Its reputation, its history, the delicate winemaking and strict rules it must adhere to – it has all the romance and passion that’s wrapped into the story of wine. 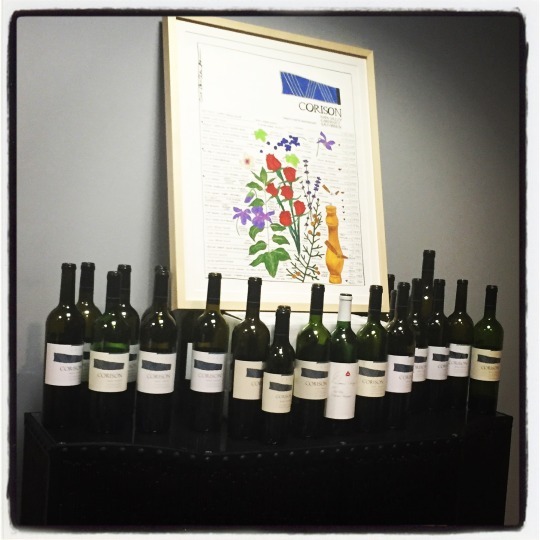 The lineup of wines poured at MacArthur Beverages on April 20, 2015 | Photo by itswinebyme. Here’s my takeaway: All six wines were beautiful in their own right. There was nothing offensive about them and I’d be happy sharing any of these bottles with anyone. (But then again, I’m sure they were chosen because they were fine examples of the vintage and terroir.) I’m not well versed in vintage variations, so I can’t say how these compares to other years. It was interesting (to me) that I didn’t get that typical “Burgundy funk” on the nose until I reached the last two wines (we tasted in order of classification, but for fun – I then tasted in reverse order as a way to revisit some of the pours). This won’t be a traditional review – I’ll leave that to the other more experienced palates who were there. * 2012 Joseph Faiveley, Bourgogne ($22): A beautiful, bright floral, fruit-forward nose. As a California girl, it reminded me a bit of Sonoma Coast’s Littorai (and while I realize that Littorai emulates Burgundy – not the other way around, it’s where my wine journey started, so inhaling this wine took me to that experience). At $22, it’s a wine that’s easy to share with anyone – whether they understand wine or not. * 2012 Joseph Drouhin, Cote de Nuits – Villages ($25): My very limited note taking during the tasting has the words “meaty” and “pepper” written down, next to this wine. Unlike the first wine, there was a bit more structure. Of all the wines, this was the least memorable to me. I didn’t taste this a second time like I did the others. Is that saying something about this wine? Maybe. * 2012 Domaine Joblot, Clos du Cellier aux Moines, Givry Premier Cru ($45): This appeared to be a crowd pleaser, or maybe just everyone was curious enough to keep going back to it. For my inexperienced Burgundy palate, this was the first wine that seemed more like traditional Burgundies I’ve tasted before. The wine appealed to my love for earthy qualities, and it was significantly deeper than the first two. 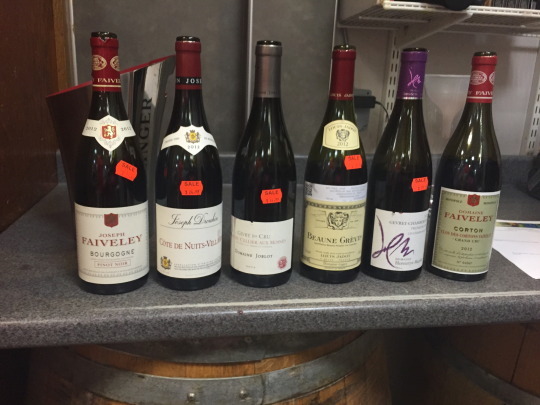 * 2012 Domaine Faiveley, Corton Clos de Cortons Faiveley Grand Cru ($220): Phil was quick to point out that this is the only Premier Cru that includes its Domaine’s name on the wine. Is it a sign of confidence? Is this wine that special or different? Is it a marketing ploy? I failed to ask those questions. As the only Grand Cru in this lineup, it’s rich complexity was to be expected. What I didn’t expect was the wine tasted backwards on my palate. On first sip, it seemed slightly flat, but then the backend literally bursted in my mouth and the finish went on and on and on. I knew I was tasting something special, I only wish I had the experience to know how this wine would evolve with age. I finally made my way into Virginia wine country. This is Barboursville. I’ll admit that much of its history was lost on me. After a two-hour drive from Washington through rolling country side, I was relaxed, ready to stretch my legs and try some wine. The grounds are gorgeous. This view is just from the parking lot, but they have 900 acres to roam through. And on a non-humid barely 80-degree day in the middle of August, there’s nothing to complain about. Barboursville makes a lot of wines! I failed to count, but I’m guessing we tried at least 12. What stood out were the Italian varietals, which are their specialty. After all, the modern winery that’s there now was born from an Italian winemaker. The Sangiovese makes for a nice table wine – juicy and not too overbearing. Medium bodied and well balanced. The Nebbiolo was dark and intense, with meatiness, earthiness and complexity. And while neither put me over the edge to purchase, I did later have a glass of the Nebbiolo during our stop at Early Mountain (which features many other Virginia wines besides their own). I brought home a single bottle of the Barboursville 2010 Octagon, a Cabernet, Cabernet Franc, Merlot blend with one of the longest finishes I can remember. Funny – because after enjoying the Italian varietals, I chose the one wine I generally avoid (Cabernet and Cabernet blends are often at the bottom of my tasting lists – but that’s a posting for another time). Is Wine-Tasting Junk Science? That’s a very debatable question, but regardless of which position to take, I absolutely adore this comparison to a blind kissing contest. Yet another pleasure worth exploring. NPR’s “commentary on science and society” blog explains.